The animation talent of Chuck Jones combined with the delightful prose of the great Dr. Seuss results in a Christmas cartoon classic that will make even the most resolute cynic warm to its sneaky holiday message. Horror icon Boris Karloff supplies the voice of the Grinch, who plans on spitefully ruining Christmas for the town of Whoville by stealing all the presents. It's great, mischievous fun plotting along with this diabolical humbug, and ultimately moving as he warms to the spirit of Christmas. When the name "Chuck Jones" pops up, I'd bet that most people immediately think of Looney Tunes cartoons. After all, that's where he made his claim to fame, and I believe that most people would associate him with that material. However, I'd also bet that no individual Looney Tunes cartoon qualifies as Jones' most well-known and most watched piece of work. That honor almost certainly falls to the classic TV special that he produced, How the Grinch Stole Christmas. How many skillions of people have seen that sucker since it first aired in 1966? Many, many skillions, I'd guess, and that's a lot! Of course, since the formal title of this program is actually Dr. Seuss' How the Grinch Stole Christmas, Jones is overshadowed in this work by the prominence of another. Actually, we should make that others, since lead voice actor Boris Karloff would receive higher billing than Jones. But make no mistake about it. While Seuss' story and Karloff's vocal certainly contribute in no small part to the success of this program, it's Jones' wonderful and evocative animation that carries the day. It's not technically very slick - after all, this project was produced for television, a medium that doesn't offer a budget to allow an animator to perform to the best of his abilities - but it helps capture the spirit of the project and brings it nicely to life. Yes, more fluid animation would have been good, but the heart of the Dr. Seuss story comes through and works very well. I must admit that while I like The Grinch, it's not really one of my favorite Christmas specials. 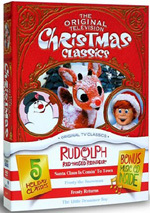 Rudolph, Charlie Brown and The Year Without a Santa Claus are all above it in my opinion. Nonetheless, The Grinch deserves its status as a Christmas classic and will continue to be watched by skillions for years to come. Much less well remembered is the companion piece on this DVD, 1970's Horton Hears A Who, but that doesn't mean it's not a strong program. 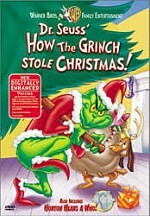 Actually, I think I prefer it to The Grinch, though some of that may be the result of too much repetition of the latter. While I saw Horton as a youngster, I definitely didn't watch it nearly as many times as I did The Grinch, so it doesn't possess the same level of familiarity. I mean, I can't remember the last time I saw The Grinch - it's been more than a decade, I'd guess – but I still know it by heart. The same can't be said for Horton, which looked familiar but not to nearly the same degree. 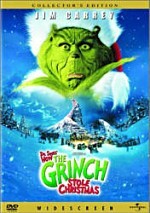 Both The Grinch Who Stole Christmas and Horton Hears a Who appear in an aspect ratio of 1.33:1 on this single-sided, single-layered DVD; due to those dimensions, the image has not been enhanced for 16X9 televisions. The two programs offered fairly similar visuals, though Horton looked a little better. The two programs demonstrated acceptable sharpness, though some shots came across as a little tentative. I saw some signs of shimmering, and edge enhancement was a bit of a distraction; the show often displayed a somewhat rough “digital” look. A mix of specks and marks popped up through the program. These weren’t heavy, but they created some distractions. In addition, too much grain cropped up throughout the programs. Colors seemed decent, with some exceptions. The piece suffered from a slightly grimy look that made the tones a little dingy, but they often came across as reasonably dynamic. What was the main exception? The Grinch himself. Instead of the expected green, the Grinch suffered from an odd mustard tone. Blacks were fairly dark, while low-light elements showed good clarity. These images were watchable, but the flaws meant the overall disc didn’t get a grade above a “C-”. The sound of both The Grinch and Horton differed, and here the latter won. Although The Grinch was monaural, Horton appeared in stereo. Only the music sounded that way. Dialogue and effects both emanated strictly from the center area. 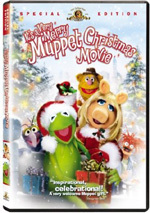 (Note that the DVD incorrectly lists the audio of Grinch as Dolby Surround). The stereo spread for the score worked quite well, as Horton displayed very nice delineation. As for the audio quality, Horton showed good range and clarity for the music. The score and songs was clear and reasonably dynamic. The rest of it seemed more lackluster, though, as speech and effects came across as a bit flat and plain. Still, they seemed find given their age, and the show included so much music that those elements compensated to give us a “B-”. Grinch was less pleasing. Music consistently sounded clean and reasonably vibrant; low end was lacking, but the general tone seemed fair. Both dialogue and effects were decent but usually flat and blah; there's a plainness to them that lacked treble and crispness. Boris Karloff’s narration sounded especially distant and wasn’t particularly natural. The Grinch audio seemed acceptable for material from the Sixties, but don’t expect much from them. This package tosses in a few supplements. We find an audio commentary from animator Phil Roman and voice actor June Foray. Both sit together for a running, screen-specific chat. Since the show only lasts 25 minutes, there's not a whole lot of depth to their comments, and frankly it's a disappointment the track doesn't feature Jones instead, but I found this piece to be generally enjoyable. Roman provides the most actual information, although Foray chimes in with some solid historical perspective as well. It's not a great commentary, but it's a nice addition that deserves a listen. Next we find a TNT special about How the Grinch Stole Christmas that lasts 19 minutes and 15 seconds. Hosted by Phil Hartman, this 1995 program provides an excessively-cutesy but generally solid overview of The Grinch. We see then-new interviews with Chuck Jones, Dr. Seuss' widow Audrey Geisel, "You're a Mean One, Mr. Grinch" singer Thurl Ravenscroft, song composer Albert Hague, plus Grinch fans Tim Burton and Danny Elfman plus bits from Hartman and some archival footage from the production. In addition to his narration that connects the other segments and relates the story's history, Hartman offers "demonstrations" of animation technique and other aspects of filmmaking that are likely unknown to most of the public but will be very basic to more knowledgeable movie fans. Anyway, the show's clearly oriented toward a younger crowd, but it's a fairly fun and mildly informative piece. Another video program is entitled Songs In the Key of Grinch, a collection of additional interviews with Hague and Ravenscroft. In these eight minutes worth of clips - which appear to be new and not outtakes from the prior special - we learn a little more about their careers and their involvement in Grinch. It's a nice little addition to the material in the longer special. A Song Selections section lets you jump straight to any of the show's four tunes ("Opening", "Trim Up the Tree", "Welcome, Christmas", and "You're A Mean One, Mr. Grinch"). There's a ridiculously easy 10-question trivia game. Each item offers three choices, and if you get it wrong, you can try again until you respond correctly. Even if you make it to the end, you get no real reward for doing so. This is best left for the little ones who might actually get a kick out of it. Pencil Tests provides three sketches of the Grinch, while Who's Who In Whoville gives us brief biographies of Chuck Jones, Dr. Seuss, Boris Karloff, and June Foray. The Horton portion of the DVD includes five still frame pencil sketches created during preparation for the program and another area of "Song Selections"; here we can jump straight to "Doc Hoovey", "Wickersham Brothers' Song", "We Are Here", and "Be Kind to Your Small Person Friends". How odd that they don't link to all of the show's tunes; why can't we jump straight to "Mrs. Toucanella."? Since three of the four folks listed in the "Who's Who In Whoville" area of The Grinch also worked on Horton - everyone but Karloff – the biographies are already taken care of. However, it would have been nice to have those repeated on the Horton side with the addition of that show's narrator and main voice, Hans Conried. Although I recommended the prior release of How The Grinch Stole Christmas/Horton Hears a Who, it was a tenuous endorsement at best; the programs themselves are quite entertaining, but the list price of $20 seemed high for 50 minutes of entertainment with no substantial supplements. The new package largely eliminates those qualms. It bears the same retail cost but provides a complement of new features. As such, The Grinch/Horton should make a nice addition to your collection. To rate this film, visit the Birthday Edition review of HOW THE GRINCH STOLE CHRISTMAS / HORTON HEARS A WHO!